We invite you to explore India - the Land with infinite beauty ! Whether you soar high into Himalayas or peer under the ruins of the Ancient monuments dotting the landscape of India, you will cherish the experience long after your visit ! This India Travel Guide on Gangotri is free from any commercial interest! This site is dedicated to promote India - the vast subcontinent, its glorious past, magnificent landscape and its infinite variety. Gangotri is the holy destination that embodies the origins of the holiest of Indian rivers, the Ganga. The shrine here that sits on the river banks is dedicated to the goddess Ganga and the pujas or holy ceremonies here are elaborate affairs. Religious fervour comes alive at Gangotri as the shrine and the river here attract millions of worshipers every year. The River Ganga originates in Gaumukh in the Gangotri Glacier, about 19 kms from Gangotri. The temple at Gangotri was built by Amar Singh Thapa, a Nepalese General on the left banks of the Bhagirathi. The idol in this temple is Lord Narsimha. This place is also referred to as Bhavishya Badri. 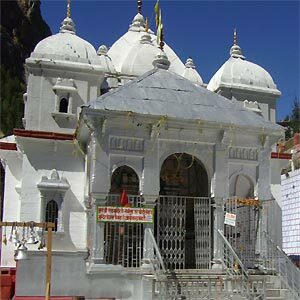 The temple at Gangotri is made in white granite and stands resplendent amidst the snow or sunshine. At the temple, you can find the Bhagirathi Shila - the stone where the legendary King Bhagirath is supposed to have sat in worship to Lord Shiva. To reinforce this belief, you will find the submerged Shivling - one that stands in water. The Gangotri Temple closes each year on Diwali day and then opens to pilgrims again in May. Pilgrims can participate in the awe-inspiring aarti conducted on the banks of the holy river Ganga. Gangotri is located at an altitude of about 3050 mts above sea level, nestled in the Garhwal Hills. Since it is possible to travel by car or bus directly to Gangotri, it sees more pilgrims and tourists. Gangotri is about 100 kms from Uttarkashi. Rishikesh is about 250 kms away while it is about 300 kms from Dehradun. Devotees can visit Gangotri between May and December.